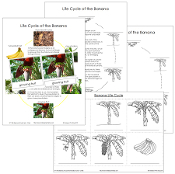 Banana Life Cycle Nomenclature Cards are formatted in a 3-part card series with black-line master included. Includes photographic pictures: rhizome to fruit, rhizome with roots, pseudostem, emerging inflorescence, growing fruit, mature fruit, and harvested fruit. Cards with label are approx. 3¾ x 4", cards without label are approx. 1" shorter. Charts are 8½" x 11".